Create Android App for your novels, reports, poems, travels, proses to publish onto Android stores. Combine text and images to build Android Book Apps. Easy convert to Android App without any programming required. Fully customize your App book, like Author, Name, Category, Website, etc.. Enable readers to control the book App easily, Day/Night modes, Font settings and so on. Convert PDF file into AMAZING digital-brochure UNLIMITED projects, see Flip PDF. Flip Book for Android is software helps to convert text and images to Android Book Apps in minutes. You can define the Book Name, Author, Category, Website and Description for your Book Apps. After publishing the book onto Android market, people will be enabled to flip or scroll your pages, viewing all book info, change book modes into Day/Night, reset fonts, line space, background color and so on. Build your wonderful Android Apps for people to download and read in their Android tables, smartphones now! With the easy to use interface of Flip Book for Andorid, you can easy convert your text novels, reports, poems, travels, proses to Android Apps. No programming knowledge needed, you can easy convert text and images to the Android book apps, and moreover, the links in original text will be retained. Just import your file or even edit in the interface, build your own App now! 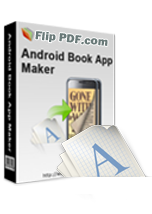 Android Book for Android enables you to build book apps to publish on Android market. 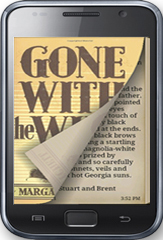 After people download the app, read your book in Android tablet or smartphones, the book pages will be flipped or scrolled like reading real books in hand. You can edit chapter name, then import or text for each chapter separately, or use texe file name or first line text as chapter names. The chapter names will be taken as Bookmark of Content for navigate people in formed book Apps. Just click and then jump to the section wanted to read, easy and convenient. When you use the Flip Book for Android tool, you will see the option "Encrypt contents of the book", this setting will help to prevent other people to extract data from your APK files, people just can read the book by downloading the APP from Android Market. Choose the option to make your book more security. When read your books on Android mobiles or tablets, people can fully customize the settings as they want. Change Font size, adjust line space, transfer between Day/Night modes, make screen light turning on/off when reading. Bring total controlable page flipping book to Android fans. No matter how powerful Flip Book for Android is, we all have the only one ultimate purpose that publish our eBook online and earn money from Android. If you have own website, that’s even easier, directly upload the output apps on your site and then earn money in some way. Or publish on Android market and then sell the books.